Since it's officially fall and the weather here is cooling down quite a bit, I'm in the mood to do some crocheting. I've been working on an afghan for my husband for several years now. Yes, I did say years. haha Anyway last night while watching Survivor I got it back out and started working on it again. I'm hoping I can finish it this year. It's gotta be before spring because I don't like to crochet in the spring or summer because it's too hot with all that laying in your lap. Anyway thought I'd show you a picture of where I am on it right now. So please someone tell me I'm not the only one that takes years to complete a crafting project. 1. It is officially fall here in North America...I realize not everyone who participates in the Hodgepodge lives in North America but if you do, what's your favorite memory of Summer 2011? If you're not in North America, what's your favorite memory of the season just ending on your side of the world? First of all, I just want to say that I love the fall. 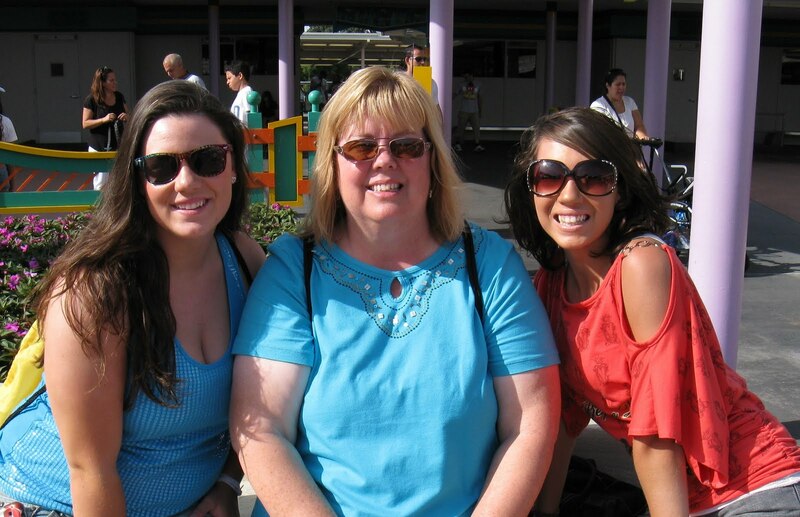 Now my favorite memory would be our trip to take Kelli back to college and spend a week in Disney World. I'm not necessarily glad my daughter is gone, but I know she is right where she wants to be so that makes me happy and we had a great vacation in the process. 2. Your favorite nut? You know I mean the edible kind, right? I'm glad you cleared that up or I may have said my husband or daughters. I probably love cashews the best. But I love peanuts an awful lot too. 3. What activity puts your sense of balance to the test? Evidently riding a bike. One of the last times I rode I fell and skinned up my knees pretty good. I haven't been much interested since. 4. How would you describe your sense of humor? 5. September 28th is National Ask a Stupid Question Day...what's your stupid question? Probably one of the stupidest questions I've heard is when our county first got 911, a person called our local police department and said I live in such and such a town, what do I have to dial to get 911. All I can say is "Here's your sign"
6. Roller skates~hula hoop~jump rope...which activity would you most enjoy? Yes, you have to choose. Probably hula hoop. I just think it's fun. 7. What's your most sentimental possession? I sure do enjoy Pinterest. I'm finding so many really neat crafts and good sounding recipes (and I don't even cook that much). Are you on Pinterest? If so, tell me how to find you so I xan follow you and get lots more good stuff. haha I think I'm hooked! If you're wanting to go to Disney, but you are afraid that your kids are too old to really enjoy it, don't let it bother you. My girls love it and they are 17 and 19. I was really a little surprised how much they wanted to have their pictures taken with the characters. I really thought they'd think that was stupid. But no, my 17 year old was always on the look out for a character and as long as the line wasn't too long, off she'd go with all the little ones to have her picture made. I'm so glad because I think these are times I'll remember for a long time. It just seems that Disney brings out the child in all of us. So here are a few pictures I thought I'd share with you. They are mostly of Kerri because Kelli was only there 1 day with us. 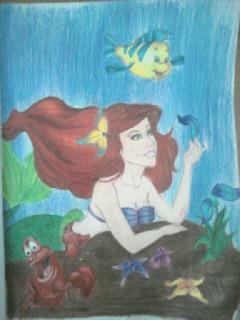 Have I ever told you that I really love Disney? lol Have a blessed day everyone! My husband and I were talking this weekend about someone we know who deliberately seeks for God in his everyday life. I admire that and have been thinking about this a lot lately. I want to be more like that and look for God moments or blessings of God in my everyday life. I just want to be more aware of God in all aspects of my every day. I know He's there in every breath, but I don't consciously think about it and I want to. I want to be very deliberate in my efforts to really see Him everyday. Lately I've noticed two of the bloggers I follow have been doing this using Multitudes on Mondays, One Thousand Gifts. These two bloggers are Debbie at Heart Choices and Jamie at Six Bricks High. These ladies both have such a heart for God and I would recommend checking out their blogs. The thought as I understand it is to list 1,000 things you are thankful for. I've decided in my efforts to be more deliberate about seeing God in my life that I will try this too. I'm thinking that if I consciously look for the blessings in my life I will definitely be seeing God. 1. A pricking of my heart from the Spirit to want to see God more. 2. A husband who encourages me in all my pursuits. 3. My daughter laughing with a good friend while on the phone...I love her laughter. 4. The opportunity to visit and then worship with family visiting from out of state. 5. Blogging friends who encourage me, even when they don't know they do. Write a blog post containing your list. I'm hoping this will encourage me to read a little more than I do. I love to read, but I won't always take the time to do it. Maybe this will help. 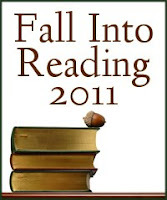 Click the words Fall into Reading 2011 above and you can connect to the linky thing and join in too. Joyce who runs the Wednesday Hodgepodge asked us about chili on Wednesday and she got me in the mood to have some. So I talked hubby into making some for supper. 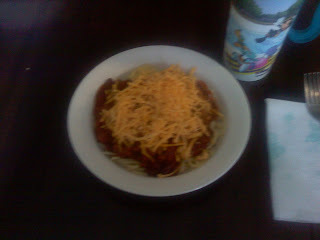 Some of you seemed surprised when I talked about having chili on spaghetti with shredded cheese on top. That's what we call a 3-way. If you add onions or beans then it's called a 4-way and if you add both it's a 5 way. 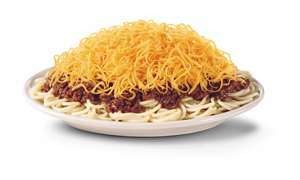 This is also known as Cincinnati Chili. We have several chain restaurants in our area with this as their specialty. Anyway, my hubby makes his chili, which is absolutely awesome by the way and a lot chunkier than these restaurants make. The picture below shows how I like to eat it. Yummy! Just thought I'd share. Book Description: Katie Ann lost the love of her life. Then God offers her a new beginning in Colorado. Katie Ann Stolzfus lives in the small Amish community of Canaan, Colorado. At forty she is widowed and raising her first child. But baby Jonas will never know his father, and Katie Ann wonders if her Heavenly Father hasn't forgotten about her as well. Is it really God's plan for her to be a single parent? Eli Detweiler has come to Canaan for a wedding and a long vacation. Having raised six children following the death of his young wife, Eli is finally an empty-nester. He's enjoying the slower pace of having no one to care for but himself. When Katie Ann and Eli meet, there is an instant connection. Yet as strong as the attraction is, they both acknowledge that a romance would never work. He is done parenting, while she has just begun. But as their friendship slowly blossoms into feelings that are as frightening as they are intoxicating, Katie Ann and Eli question if the plans they made for themselves are in line with God's plans. Can Katie Ann entrust her heart to another man, and rediscover the wonder of God's love? My Thoughts: This is a really great book if you love reading about the Amish. The characters were written very well and I loved the story line. Katie Ann was trying to learn to trust God with her life again after all that had happened to her. She also had to learn to trust people again too and to trust herself to be capable to raise her son. There was a lot of attempted matchmaking going on too with some humor involved. I loved each of the characters and was sorry to see the book end. I feel like I've left my new friends and I'm not ready to. I definitely recommend this book if you're looking for a good read. 1. Do you like chili? Red or white? Beans or no beans? Spice or no spice? Toppings? Yes, I love chili. Both red and white, but especially red. I prefer no beans and I like mine fairly mild. I love cheese on my chili and I love my chili on spaghetti noodles. Come on, we're know for our three-ways in this area where I live. 2. Red~Orange~Gold...your favorite fall color? 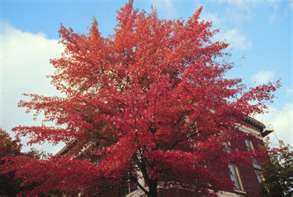 Red, I love trees with red leaves. 3. Who did you idolize when you were growing up? My aunts who played the piano. I have 3 that were my favorites. Joy, Diane and Lou. They each are awesome ladies and can play the piano unbelievably and I have always wanted to play like them. I do okay when I play, but I have never quite reached their abilities. 4. When was the last time you did something 'arts and craftsy'? Share please. Probably last winter. I seem to be more crafty in the winter time. I like to crochet and stuff in the winter. Actually I just remember I went to a cardmaking party last spring and made some greeting card. 5. What's a place that makes you really nervous? The Doctor's Office. I hate going to the doctor and I can't keep my blood pressure down because I'm always so worked up and nervous. Nay. I rode a few times when I was a child, but I don't think I'd have the nerve to get on a horse now. 7. What is your favorite cliche? Well, I can't think of too many right now, but I like this one. "There's no place like home." I love my home. It's the place I'm most comfortable and can just be myself. I can imagine a lot, but it's going to far surpass all that! Sometimes I can hardly wait! Current Books: "The Wonder of Your Love" (A Land of Canaan Series) by Beth Wiseman. I plan to be writing a review very shortly for Booksneeze on this book. I will tell you now, it is very good. Current Playlist: Mostly I listen to K-Love while I'm at work. I have a couple of southern gospel CD's I'm listening to when I'm in my car alone right now. At this very time, I don't have any music on. My iPod is full of all kinds of music...instrumental (for when I'm studying, southern gospel, contemporary gospel, country, praise and worship, Disney music, etc...very eclectic. Current Color: Probably blue or maybe red, or even teal. I just love color. Current Drink: I seem to be pretty fixated on chocolate milk lately. Not sure why, but I have a glass of skim milk with some Hershey's syrup most nights before bed lately. Who knows why. lol But otherwise it would be Diet Coke. Current Food: I'm getting into the fall thing, so soups are starting to sound really good. I had the best soup the other day at Olive Garden called Zuppa Tuscano and it was awesome. Hubby came home and found the recipe on the internet, so I plan to make it soon. If it turns out good, I'll post the recipe on here. Current Favorite Favorite: My Kindle...I love reading on my Kindle. Current Wishlist: I want a new fall purse and new shoes for work. I'm thinking about a Vera Bradley for the purse and some cute Crocs for the shoes. Did you know they have all kinds of cute styles of Crocs now? Gotta love it. Current Needs: To lose the irritation. I seem to get irritated at things and people very easily lately. Not good and not fair to my family. If you have an extra minute I could sure use some prayer on this. Current Triumph: Our new Lady's Bible Study started last week and we have 3 people that have never attended with us before. I love it. Current Bane of my Existence: Disorganization. I need to get my kitchen cabinets organized badly. I worked on my dresser drawers over the weekend, just 2 to finish and then I really need to get my kitchen finished. Current #1 Blessing: My family....I really do love them! Current Outfit: Sweat pants and my hubby's old Mickey Mouse Shirt....remember I'm getting ready for bed. Current Excitement: Not a lot of excitement going on right now, but that's okay. I just finished a wonderful vacation. My kids are back in school (college & high school). I just had my 35th anniversary at work. God is good and I'm happy with where I am. Current Link: I have to agree with Sara on this one....it's Pinterest. I'm learning to really love that site. I'm finding all kinds of good recipes, beautiful pictures and crafting ideas, etc. You really ought to check it out. So, what's on your current list? Over the weekend I got a Multimedia message from Kelli. This is what she sent and she titled it Doodle. I can't believe I'm saying this, but I'm going to go see the new Smurfs movie tonight. Added at 11:55PM: Well we did it! We really went and saw the movie. It actually was cute and fun and extremely blue! lol I think little kids would really enjoy, the 2 teenagers with me liked it and actually laughed through quite a bit of it. Of course, that's what these girls do all the time...laugh! I read that there is supposed to be one cuss word in the movie, but I never caught it. I think it's probably a pretty safe movie for kids, if you're wondering. and I liked the Raisinets and a good time was had by all. Is anyone watching the new season of Survivor. If you've been around my blog very long, you probably know I kinda like Survivor. I don't post about it a lot, but it's one of the few shows I watch, if at all possible. This season it's in the South Pacific and they brought back Redemption Island and Ozzy and Coach. Now I don't remember a lot about Ozzy from his 2 times on the show, but Coach I remember! In fact, Kelli met him last year at her college. He came and spoke and then she got his autograph and talked to him for a bit afterwards. She really liked him a lot. So, I'm watching again and last night was the first episode. Guess what, Coach is still there. He got a bit of a rocky start, but he's still there. So are you watching or not? If not, what do you like to watch? Let's get some conversation going here. 1. What do you do at the first sign of a cold? Will you get a flu shot this year? 2. What advice can you give about how to conquer fear? 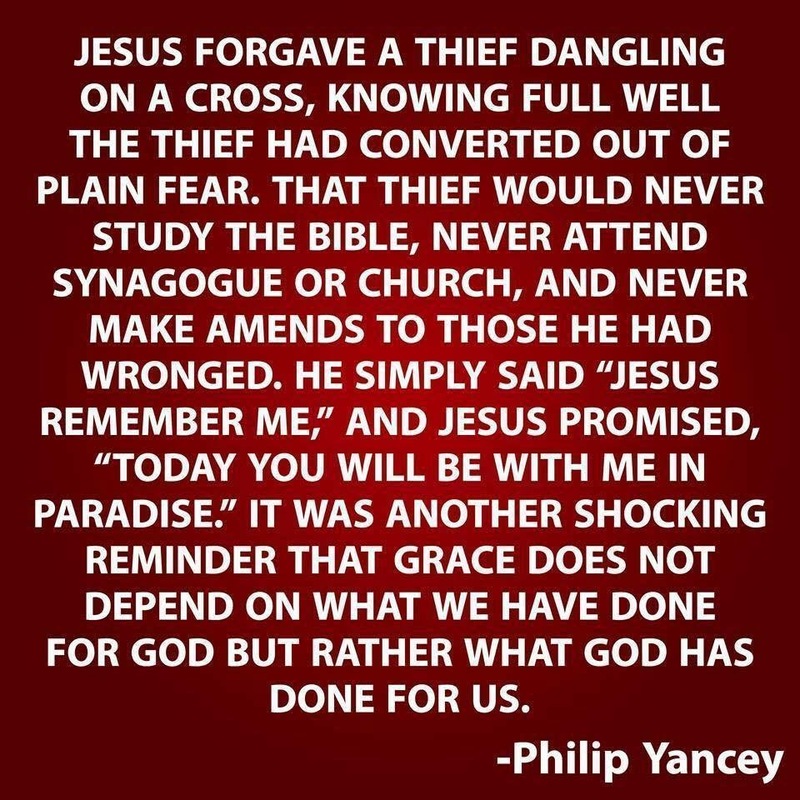 Give your fear to the Lord. He's going to be up all night anyway, so let Him worry about it. 3. Share two good things about your life right now. My husband and my girls! Hubby doesn't like his photo taken so instead here is one of the girls and me before heading into the Magic Kingdom. 4. A hot fall fashion trend in 2011 is a return to sixties style...tunics with pants, shift dresses, pencil skirts, cinched waists, bold prints, high necklines and short lengths to name a few. How does this fashion trend fit with your wardrobe and personal sense of style? 5. Were you involved in scouting as a kid? How about as an adult? No, I've never been involved in scouting. 6. Apple, pear, plum, pumpkin...your favorite fall flavor? 7. What characteristics do you think are essential in a good teacher? Yesterday was my 3rd Anniversary for blogging! I can't believe I've been doing this for 3 years. But I love all the friends I've made and the fun I've had because of it. It's time to get back to blogging. Oh how I've missed each one of you. I have read some posts of yours in the past couple of weeks and even commented once or twice (but not as much as I like). But with being on vacation and taking the oldest back to college and the youngest starting her sophomore year in her online school...to say the least we've been very busy! But it's time and here I am with some random stuff. First of all...my baby turns 17 today. I don't have a current picture to post right now because I'm at work on my lunch break writing this post. But as I tell you about our vacation in the next week or so, I promise there will be many pictures of her. She was with hubby and me for 6 days of Disney (just the 3 of us) and hubby and I don't like our pictures taken, so guess who was photographed over and over. lol Fortunately she doesn't mind and in fact I believe she would love modeling, but she thinks she's too short. I love this girl, more than you can imagine. She's always either singing or laughing it seems. HAPPY BIRTHDAY KERRI!! Our new women's Bible study starts tonight. I can't wait. I've missed being with everyone. We have such a great group. We come from multiple different churches and some don't even attend a church regularly (yet). We have all different ages (from 17 to 80 something). I absolutely love these women and I learn so much from each one of them. We will be doing another Beth Moore study. This one is called "The Inheritance". I watched the first video Sunday night and I believe this is gonna be a good one. Here's a link to see a trailer for this study if you are interested. My oldest (Kelli) is back at school now and seems to be having a ball. I'm so proud of her. She was named Student Ambassador (and a scholarship goes along with this honor). She's working hard and I know God is going to use her mightily. Well that's it for now. I gotta get back to work. Lunch break is almost over. Hey, it's 5:15pm and I just remembered this is my 3rd blogging anniversary! Yay!!!! We got home last Tuesday night and went back to work Wednesday morning. I'm trying to get caught up and hope I'll be back on here blogging soon. I've missed reading everyone's blogs. We had a great trip and I hope to get to post about it soon. We are here and having so much fun.